So many comparisons have already been made to describe Sorcerer to the Crown, and I’m going to chime in too with “This feels like epic fantasy for fans of Gail Carriger.” Zen Cho has created a world here that’s reminiscent of Austen meets Tolkien, yet at the same time it’s so wonderfully adaptable that pigeonholing this book into any one category makes it feel a bit remiss. A Regency setting is what you will get though, even if the nature of the style and story is up for debate. “Fantasy of manners” is also a subgenre that frequently crops up in discussions of novels like this, with a focus on a rigid set of expectations within a hierarchical societal structure. One of the protagonists in Sorcerer to the Crown is Zacharias Wythe, the first black sorcerer in Britain who also holds the highest office in his profession, a fact that makes him the target of much opposition and bigotry from many of his so-called “socially-refined” peers who feel that a freed slave should not have risen so far above his station. Institutional racism and oppression is a real menace in this story, even overshadowing the threats of war from France, the dwindling magical resources of England, and the political entanglements involving the matter of witches and belligerent visiting diplomats. In spite of all that’s going on, Zacharias’ greatest enemies end up being his own neighbors and fellows. Already plagued with ugly rumors surrounding the death of his predecessor and adoptive guardian, now it seems someone has decided to go even further by attempting to murder Zacharias. Just when he thinks life couldn’t get complicated enough, along also comes Prunella Gentleman, a mixed-race young woman of considerable thaumaturgical power, and Zacharias takes it upon himself to mentor her in a society where women using magic is considered anathema. The fleeting mention of Prunella in the book’s blurb actually belies the huge role that she plays. While I adored Zacharias, to me it was Prunella who stole the show as the star of the novel with the sheer force of her personality. In every proper situation she somehow still manages to find a way to throw expectations back into the scandalized faces of those who naively thought they could use tradition to keep her in line. It was also very entertaining to see how often she bends etiquette to her advantage, wielding it as a weapon rather than letting it restrict her (as evidenced by a particularly hilarious scene where she proposes the use of gossip and rumor as a way to actually deflect potential damage to her reputation). I loved her for her frankness and her thoroughly unbreakable spirit, and because she is strong, ruthless, and determined – in other words, the opposite of everything the small-minded folks in this book say about women magicians. I was also surprised at how light-hearted this novel was, some of its weightier themes notwithstanding. I definitely don’t claim to be an expert in Regency fiction or books of this type, but it’s my understanding that a particular style of humor is frequently employed and that it could be quite tricky to pull off. For what it’s worth, I thought the author nailed it. There’s some genuine wit in here, subtle but also infused with that certain Austenesque charm. That said, I wouldn’t exactly call Sorcerer to the Crown an easy read, especially if you’re not use to the style, which I’m personally wasn’t. I confess to having a difficult time at the beginning of the novel while adjusting to the writing, which I thought it was a little hard on the eyes and it made reading slow. But eventually I did get into it, as you can see; once I reached a point where I could enjoy myself and start appreciating its cleverness and nuances, this novel was a pure joy. Zen Cho crafts her setting with much love and care, evoking the Regency era and all its punctilious social arrangements but also manages to seamlessly weave in romance, adventure and political intrigue – and I haven’t even gotten the chance to mention the magic and all the fantastical creatures yet. Dandy socialites, posh boarding school matrons and quarreling politicians share this wonderfully unique world with fairies, dragons and magicians. It is a truly delightful alternate history where magic is an integral part of life. You really can’t ask for more. 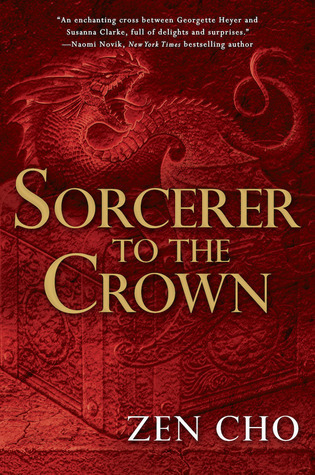 Sorcerer to the Crown is a deftly written novel that thoroughly explores important issues, adding further depth to a story already rich with memorable characters and a pleasantly entertaining plot. Zen Cho is a new fantasy novelist who is immediately going on my list of authors to watch, and I’m looking forward to her next book in this series. Oh yes everytone really enjoyed this one and I confess that at first I thought it was a part of a series so I didn’t take it but I should have. I’ll have to try soon! thanks! We are usually aligned in opinion, but this one, sadly, didn’t work so well for me. One part comes from the fact it is very much is a mix of Heyer and Clarke and I am not a fan of either- I bought it because i liked novella Cho wrote. Other part is that, while I respect whole critique-of-british- ton-disguised-as-satire thing, I feel like it was a bit too silly in places, especially in final confrontation scene. Still, I was glad I read it, even if it’s not my cup of tea. I’m beginning to see quite a bit of buzz around this – definitely sounds like something I’d enjoy. Thanks! You’re welcome, and I hope you get a chance to read the book! I’m so curious to read this, because reviews seem to be divided. It’s funny because I’m reading The Aeronaut’s Windlass right now and struggling a bit with the writing style. It’s very much like reading Jane Austen, very formal writing and dialog. (But I’m loving it!) Can’t wait! Really! I would not have expected that kind of style from Butcher, like AT ALL. Very curious about it now, I’ll have to get to Aeronaut’s Windlass soon! This book sounds like it will charm my socks off! My next read for sure after I finish my current book. Beautiful review, you have me so pumped for it! it sounds like everything I love: romance, racial issues addressed, gender issues addressed, and a WoC writer to boot! i love how you say this could be “austen meets tolkien” because that’s an interesting comparison to make! great review ! it sounds like a good book! i mgiht have to check it out sometime! this is my first time stopping by your blog ( just discovered it today) and i love your blog design and layout! Also, i noticed a few books with dragons on it that you wrote reviews for, so i’m definitely reading those next! anything with dragons is usally cool in my book! :) it’s nice to meet you! happy friday! Yeah, I tried to describe the epic fantasy meets Austen feel, it was the best way I could come up with though I probably still didn’t do it justice, lol! Like I said, it’s very adaptable, very unique and tough to explain! 🙂 Thanks for dropping by and nice to meet you too! *pumps fist in the air* I’m so glad that you enjoyed reading this one. Great review! Yeah – this was fun – and with lots of silly! A very enjoyable read. Lovely review. Lots of comparisons for this book and it’s easy to see why the writing style wouldn’t be for everyone. I really enjoy anything set in the Regency period so it felt familiar to me I suppose. I’m torn on this one. The Regency setting holds little allure to me, and the idea of spending any amount of time around a bunch of stuck-up socialites, even if they’re fictional ones, isn’t a pleasant prospect. That said, I do like to get outside my comfort zone as much as I can, so maybe this’d be the ticket. Oh, how I loved Prunella. I actually took me a loooong time to get into this one. I don’t know if I just wasn’t in the mood for it or what, but I had almost given up on it. Then this past weekend . . . read it in an afternoon. And loved it. Great review, Mogsy!